Think of a simple situation in which you want to be able to speak a few words in your new language. FLOWENTLY: Meet up with your Flowently tutor and learn ‘the magic phrases’ and how you can use them in every-day situations. Learn how to order your first drink, do your first shopping and make your first appointments in your new language with your tutor by your side. Learning by doing. Consistency! Find a language habit that you can follow even when you are tired, sick or madly in love. FLOWENTLY Motto: Link language to your lifestyle! Drink your coffee while reading a Dutch news paper. Listen to a Dutch tv show while cooking and find more little habits. Feel more comfortable and have fun. The more you invite a foreign language into your daily life, the more your brain will consider it something useful and worth caring about. Use every opportunity to get exposed to the new language. FLOWENTLY: Label objects in your house, watch children’s programmes, invite people to speak to you even if you can only respond in your own language and train your ears. Learn about funny expressions and humour. A funny thing like resetting the language on your phone can help you learn new words right away. Ditto for changing the language on your browser. FLOWENTLY: See our list of useful links. Use your mobile phone for learning a new language making photographs and recordings of words and situations you don’t understand. Bring them with you to your next Flowently sessions and your tutor will explain their uses to you. Being interested and active will help you. 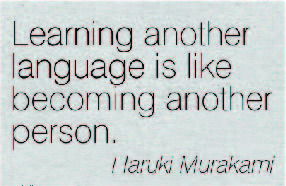 Learning a language has always been about focusing on the experiences that the new language would open up. Think of fun things you want to do anyway, and make them into a language learning opportunity. FLOWENTLY: Check out our variety of sessions such as Welcome Tour, Market Tour, Visit a Museum or Outdoor and be guided by your personal tutor, experience local culture and customs, go where the locals go. Interacting in your new language is key – it will teach you to intuitively express your thoughts, instead of mentally translating each sentence before you say it. Find native speakers near you. FLOWENTLY: Meet the locals and learn to interact in daily life situations. Improve your daily chat, ja gezellig! One of the most common barriers to conversing in a new language is the fear of making mistakes. But native speakers are like doting parents: any attempt from you to communicate in their language is objective proof that you are a gifted genius. They’ll appreciate your effort and even help you. Nervous about having a conversation with a peer? Try testing your language skills with someone a little younger. Be patient with your self. FLOWENTLY: Our friendly tutors are well-trained in the Flowently method and will help you feel more comfortable in your new language. Flowently advice for clients: Take a step back and try to communicate on a basic level when you start speaking a new language. And don’t forget; any accent is charming! Flowently > Tips > HOW TO LEARN A NEW LANGUAGE?